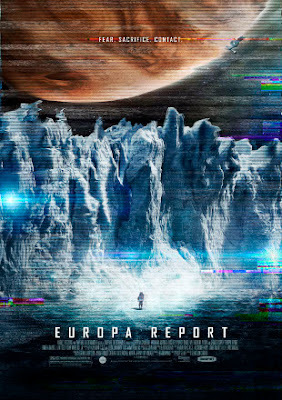 Europa Report (2013) is a found-footage science fiction movie about the first manned space-flight to Jupiter and its icy moon, Europa. The film’s text is assembled from a variety of “feeds” -- from cameras positioned on space suit helmets, on spaceship exteriors, and so on -- and the sum result is one of the best nuts-and-bolts space travel movies in a long time. The film feels very authentic, and shies away from melodrama wherever possible. Harnessing impressive special effects, Europa Report does a remarkable job diagramming the not-always-exciting routine of life in space for the six astronauts aboard the spaceship Europa One. Beyond that considerable achievement, the film also reminds audiences of a bygone age when real-life or contemporary astronauts -- not future spaceship jockeys -- were considered heroes. Think Destination Moon (1950), or Space: 1999 (1975 -1997) for example. Outer space is not just the bailiwick of future, idealized man in stories like these…but of questing, fragile modern man too. Accordingly, Europa Report concerns the long, difficult march to expand the frontiers of human knowledge, and the casualties suffered along the way of such dramatic expansion. Such casualties will occur as we conquer the frontier of space, Europa Report declares without sentiment or pathos, but those losses can’t be a reason or excuse to stop trying, to stop exploring, or to stop looking beyond the next horizon. The astronauts of the film demonstrate this theory in practice, time and again, and thus reflect the essential courage of the human race. 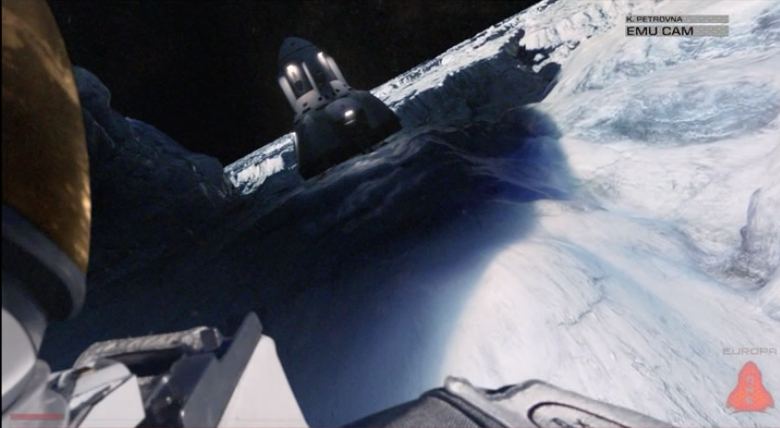 There are some horror elements featured in Europa Report, though they are very mild compared to the other found footage space movie of this type, Apollo 18 (2011). 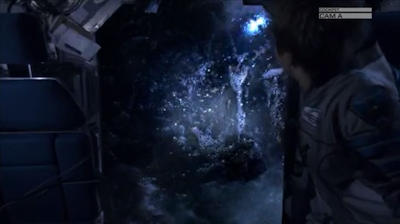 Importantly, one doesn’t leave a viewing of Europa Report feeling scared or throttled by the dark, black expanses of the cosmos, but rather inspired by its multitudinous possibilities, and our capability to face them with composure and dignity. Dr. Samantha Unger (Embeth Davidtz) and the personnel at Europa Ventures recount the story of Europa One, a privately-funded space mission to Jupiter. The ship departed from Earth with a crew of six aboard, and remained in contact with Unger and her team until solar flares knocked out the ship’s communications array. Although it was believed for a span that the ship was lost, the crew actually survived -- save for one casualty -- and continued on its long, lonely sojourn to Europa. The ship successfully landed there, in a chaotic terrain of thick ice. Despite its loss, the crew opted to go forward with their mission in search of alien life. First attempts to probe beneath Europa’s ice -- to the cold lakes below -- resulted in a loss of equipment following a strange encounter with something bright, or bio-luminescent. One determined crew-member, Katya (Karolina Wydra) then undertook a surface walk and also died when something luminescent and alive seemed to break the ice near her location and pull her down into the freezing water. Before she was lost, however, Katya discovered evidence of a single-celled life-form. With their mission achieved, the crew of Europa One then attempted to launch the landing module and return to space, but suffered a catastrophic malfunction. After crashing on thin ice on Europa, The ship’s last survivor, pilot Rosa Dasque (Anamaria Marinca) managed to re-establish communication up-link with Earth. Her final transmission to Unger revealed the presence of something amazing – something miraculous – in the waters of Europa. Europa Report succeeds as a drama largely because it so thoroughly immerses audiences in the lives and experiences of its six astronauts. Over the course of the film, we learn about the ship’s “inadequate” shower facilities, that crew-members were permitted only four changes of clothes for the duration of the journey, and just two pairs of shoes. We watch as they debate courses of action, occasionally bicker with one another, but most of all brave the isolation of space and the specter of unknown every single day with an attitude of can-do pragmatism. 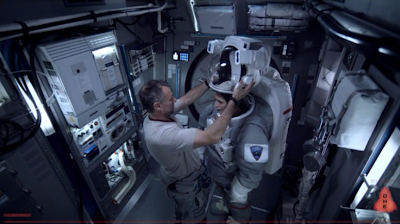 In short, the astronauts in the film successfully transmit as real people, and that fact helps immeasurably to establish Europa Report’s sense of immediacy and reality. These men and women occasionally second-guess themselves, or wonder if their actions are “pointless,” but ultimately -- during every daunting challenge -- demonstrate their true colors. Just about the sole exception to this non-histrionic presentation of humanity is the story arc constructed for engineer James Corrigan (Shartlo Copley), a husband and father whose final fate is sealed from the first moment that he is established as a loving family man. 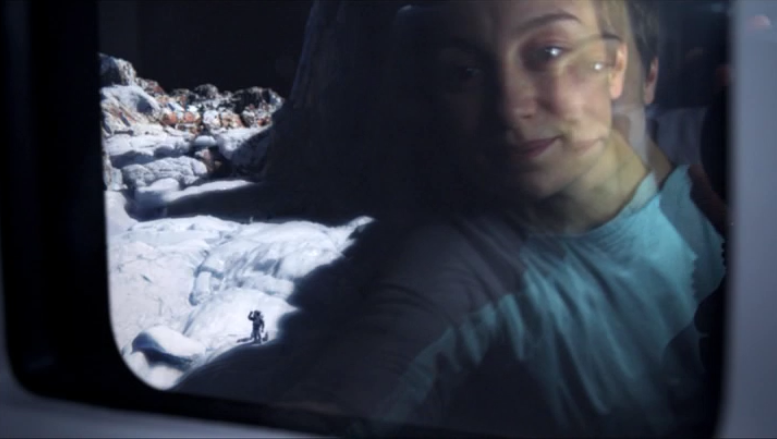 Corrigan’s fate is utterly predictable, and the most stereotypical “Hollywood” aspect of Europa Report. Although the found-footage format largely eschews the possibility of deploying traditional film grammar compositions to make form reflect content, the visuals of Europa One are nonetheless intelligently-wrought. Most of the film takes place inside of a tin can…or metal coffin. And outside that tin can is only…infinite nothingness. The take-away from this setting is that the crew is far from help -- far from anything, in fact -- and yet confined or imprisoned at the same time. “So little space in here, and so much space out there,” one character notes trenchantly. It’s a weird dynamic that can play havoc with the stability of the human psyche, and indeed, one character -- Andrei -- often seems on the verge of losing his grip on reality. But again, the film is not about a big, dramatic flourishes, or an operatic descent into madness. It’s about people holding on, sometimes by their fingernails, because they believe the destination is worth the journey. Occasionally, Europa Report also has some fun with the science fiction genre, and its historical antecedents. After Europa’s successful launch, for instance, Earth’s mission control plays a song for the crew: The Blue Danube Waltz. Of course, The Blue Danube was utilized by Stanley Kubrick in 2001: A Space Odyssey (1968) and in that setting it established the dance-like nature of two space-craft in intricate, inter-connected motion, preparing to dock. 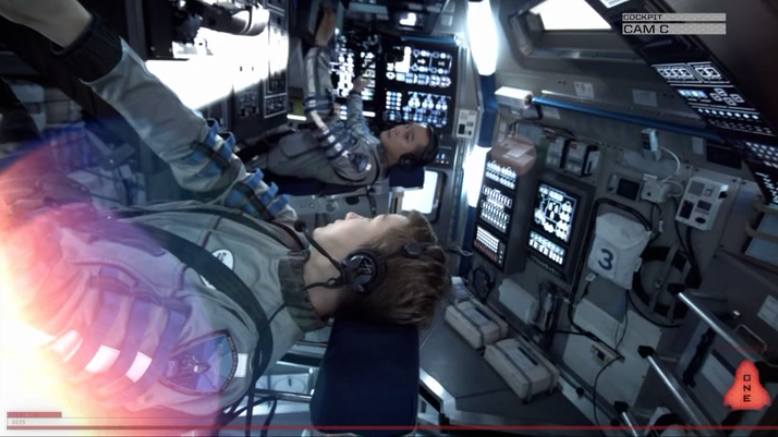 But soon after the Blue Danube is played in Europa Report, the astronauts put on their own brand of music: rap. This scene is a good callback to genre history, but simultaneously a reminder that musical preferences may change, but the drive to conquer space remains, well, universal. Also the use of rap music in an outer space setting, even briefly, suggests spontaneity and informality, the very opposite of Stanley Kubrick’s highly-formalized, highly-structured universe in 2001. This moment could qualify as one where form (rap) reflects theme (the spontaneity, cinema-verite approach of the found footage genre), to be certain. Europa Report features no significant action scenes or set-pieces, but nonetheless does a terrific job of showcasing how the astronauts’ world closes in around them and shrinks, one decision after the other. Even as options are cut-off from them, and possibilities foreclose, the astronauts take steps, at every juncture, to complete their mission. Not because they are soulless marionettes marching in lock-step, but because they realize that their endeavor on Europa is bigger than their lives. Imbued with that sense of importance, they make decisions -- without whining or second guessing -- that you or I would no doubt find difficult. At one point, for example, survival of any of the crew-members is no longer a reasonable possibility. But instead of giving up and waiting for the inevitable, the survivors switch gears and seek to accomplish something positive. They can still repair the communications equipment -- though to do so they will lose energy to their life support systems -- and therefore report their stunning findings to Earth. In other words, the astronauts are able to set aside their own self-interest and make a decision that benefits the rest of mankind. They judge their knowledge and experience more important than a continuance of their own lives. They don’t make grand speeches about their decision, either. They just do it, hence the lack of histrionics and melodrama. The sacrifices go uncommented upon by the crew, though Dr. Unger appreciatively notes their devotion to their cause. 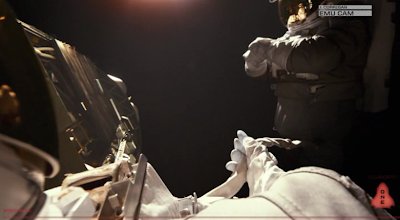 I found this non-sentimental approach quite inspiring, and it struck me while I watched Europa Report (2013) how in recent years, our society has become so “safe” that most of us simply cannot fathom people risking their lives for a cause such as this. We want everyone to be safe, all the times, no matter what. But if we are ever to open the doorway to the next chapter of space travel, one thing is for certain: people are going to die to make it happen. Is the human race ready to accept those losses so that we can, once more, take a giant step for man? Just saw this movie yesterday and I agree with your review. An excellent movie and the sense of isolation is extremely well done. John I like your review of Europa Report because the detail of your thoughts confirms what I thought of this film too. 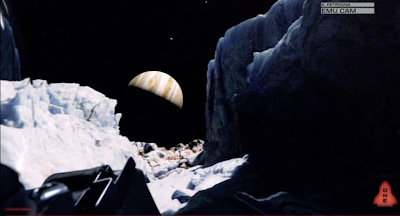 I liked the nod to 2001:A Space Odyssey because I immediately felt as though the spaceship Europa One journey was a echo of the Discovery 1 journey in the Kubrick film. 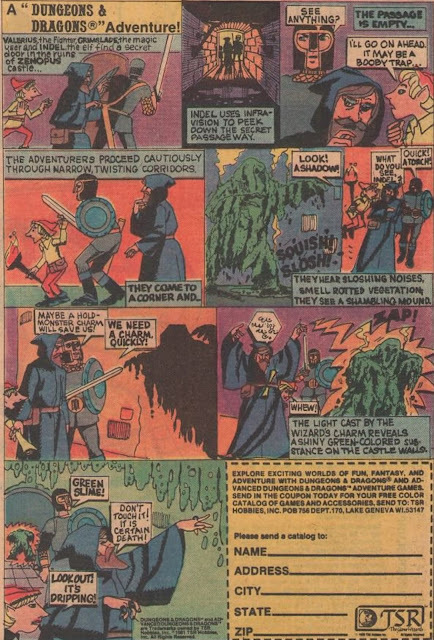 The Europa Ventures recount of the story of the Europa One journey reminds me of the Space:1999 "Dragon's Domain" episode with Helena's recount of the Ultra Probe mission. This came up as a Netflix suggestion the other day and I decided to watch it, not so much because of the found-footage nature (I'd honestly completely forgotten about that part of it) but more that I've been in a science-fiction / space film place recently. I was pleased to see that it was done in the more 'documentary' style that I find I'm enjoying the most when it comes to found-footage cinema and all the cameras seemed plausible. In short - I very much enjoyed it. I also liked the nod given to 2001. Not only did I find it wholly appropriate, but it put me in an interesting mind set as that was a literary series I followed for a while. It almost seemed a spiritual continuation of the story in 2010, wherein humanity is warned away from Europa, and could almost serve as a rough sort of bridging chapter to the 2061 novel, wherein a human spacecraft is forced to crash land (and others sent to rescue it). Obviously it's not in the same time continuity - but it gave me an interesting lens through which to view this film.